Size: -- Choose Size -- Customize up to waist 45" L 42"-46" M 36"-42" S 30"-36" XL 46"-50" XXL 50"-54"
The belt is designed to be used with the majority of informal or even military jeans. 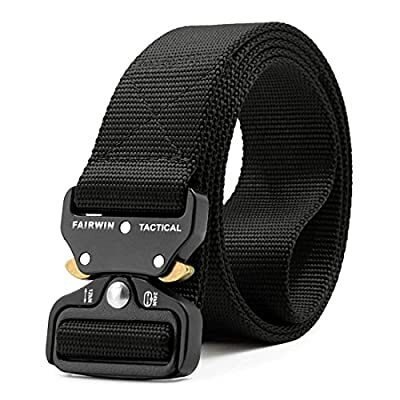 Whether you bring day-to-day, or even just desire a strong belt that is going to hold up against misuse without losing convenience, the Fairwin military belt is an ideal selection. Quick release, sturdy buckle developed to last, relaxed and secure.The quick release functionality is instinctive and soft when you press the 2 gold buttons down at the same time. If just one button is interacted, the relationship is going to still hold and entirely re-lock by itself. Environment-friendly nylon product: Our waistbands are made from premium quality, 1.5" nylon webbing. Flexible dimension: allowing for movement of your waistline or even for the extra space you need for your everyday bring. Twist keep in mind: While our company discover the belt to work effectively with some belt loopholes, the majority of belt loopholes may be too little to suit the buckle through. In this particular case, each time you desire to take the belt on/off a pair of jeans, satisfy eliminate the male end of the buckle, loop the nylon through the belt loopholes, then re-install the male buckle. Colors available: Black, Brown, Environment-friendly. Guarantee: 2-year no questions asked guarantee and 30-day cash back guarantee. Note: The internet belt is certainly not created repulsing and climbing up treatments. FAIRWIN is a registered trademark. Our experts aim to offer the best services and products to our consumers. Here, our company believe you can always discover an acceptable item and have a nice purchasing experience. Tactical Belt Length - 45-61 inch, Width:1.5 inch, fit for waist up to 54 inches. Buckle Size: 2" in width and 5/16" in thickness. Heavy Duty Metal Buckle - This tactical belt features a military belt buckle made of heavy-duty metal. Quick Release - Intuitive and smooth quick release functionality when you push the golden tabs down at the same time. If just one tab is engaged, the connection will hold and fully re-lock on its own. Quality Nylon Belt - Made by 1000 D environmental friendly nylon material, soft and comfortable for daily use. Perfect Service - 2 year quality warranty. 60 day hassle free return policy.